Diseases of affluence are top killers the United States and other industrialized countries. Heart disease, stroke, cancer, and diabetes cause the premature death of more than a million people a year in the U.S. alone. These conditions have been repeatedly linked with the consumption of meat and other animal products. Moving toward a plant-based diet will significantly reduce the number of people who fall victim to diet-related diseases. Vascular diseases, including heart diseases and stroke, are caused by blockage of the arteries that supply oxygenated blood to the body's vital organs. The blockages are caused by a build-up of fatty plaque along the artery walls. This condition is called atherosclerosis. Total blockage of an artery leading to the heart or the brain brings on a heart attack or stroke. Nearly 800,000 Americans die each year of vascular diseases. Diets laden with saturated fat, cholesterol, and salt are the key factors in the incidence of cardiovascular diseases. Cholesterol is the key component of the fatty plaques. Saturated fats raise blood cholesterol level more than any other factor. Salt consumption promotes water retention and blood volume, leading to hyper-tension, which contributes to the incidence of heart disease and stroke, as well as to rupture of blood vessels. All animal foods contain cholesterol, but no plant foods do. In fact, antioxidants and folic acid in plant foods protect arteries from plaque formation. Plant-based foods are also naturally low in saturated fats and salt, and their potassium reduces hypertension. Additionally, fiber, which is found exclusively in plant products, has been shown to decrease blood cholesterol. Cancer is actually a variety of diseases that occur when the cells grow out of control, spread through the body, and interfere with the function of a vital organ. 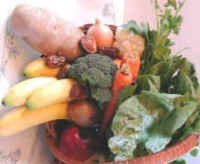 Cancers of the lung, breast, prostate, and the digestive tract have all been linked with a diet high in animal foods. Nearly 560,000 Americans die of cancer each year. Consumption of animal fats raises blood testosterone and estrogen levels that promote prostate and breast cancers, respectively. Carcinogenic pesticides spread on animal feedcrops accumulate in animals' fatty tissues. In the digestive tract, animal fats interact with bile acids to release carcinogens. All animal fats heated to high temperatures, as in deep-fried foods, also form carcinogens. Nitrites in hot dogs and other 'cured' meat products are known carcinogens. Insulin Growth Factor (IGF) in dairy products promotes malignant cell growth. Conversely, plant foods contain fiber, which helps prevent cancer of the digestive tract by speeding food transit before formation of the carcinogens and reduces the risk of breast cancer, perhaps by lowering estrogen level. Plants also contain antioxidants and flavones that impede formation of cancer cells. Animal fat in the bloodstream blocks insulin from playing its vital role. The cells of our body feed on glucose that is escorted by insulin. This causes adult-onset or Type II diabetes. The incidence of this disease has been growing among both adults and children because of their faulty diet. In some children, cow's milk generates antibodies that destroy the pancreatic cells that produce insulin, leading to Type I diabetes. Diabetes is a serious disease, which causes shortness of breath, vomiting, dehydration, and eventually contributes to heart and kidney diseases. Diabetes kills 75,000 Americans each year. Kidney stones and other kidney diseases are typically associated with excessive consumption of meat, dairy, and other proteins that these organs convert into fat and waste products. Kidney diseases kill 44,000 Americans each year. Dairy products are responsible for a number of serious digestive and allergic reactions. Nearly 50 million Americans, including 75% of African Americans and 90% of Asian Americans, suffer from severe cramps caused by lactose intolerance. Common allergic reactions include asthma, skin rashes, and ear infections. Pathogens that thrive in animal foods are among the primary causes of food poisoning. The biggest culprits are Escherichia coli, Salmonella enteritidis, Campylobacter jejuni, and Listeria monocytogenes. These diseases cause several days of misery and occasionally deaths. The Centers for Disease Control estimate that 9 million cases occur annually, though most are not reported. Meat products also contain antibiotic residues, which build up resistance in pathogens, and render antibiotics less effective in treating infectious diseases.